This is an amazing item. I have admired Air B and B rental and this just makes things including cleaning so much easier! I am very happy with this purchase! Life and Home is a small start-up company in the heart of Brooklyn which believes in an effortless living. Family owned and operated since the start, ours is a history of simple beginnings driven by a sense of utility. In 2001, as Ace Hardware Outlet, we sold our first industrial appliance - a pressure cooker - and have since consistently expanded out selection of products with your convenience and ease in mind. From your garden to your kitchen and all else between, it's here - everything for your life and home. For customer service inquiries or to initiate a return, please contact Life and Home at customerservice@lifeandhome.com or 212-400-7488 or 877-289-9760. The classic dispenser offers one of the most attractive, practical and convenient solutions to de-clutter your shower area. 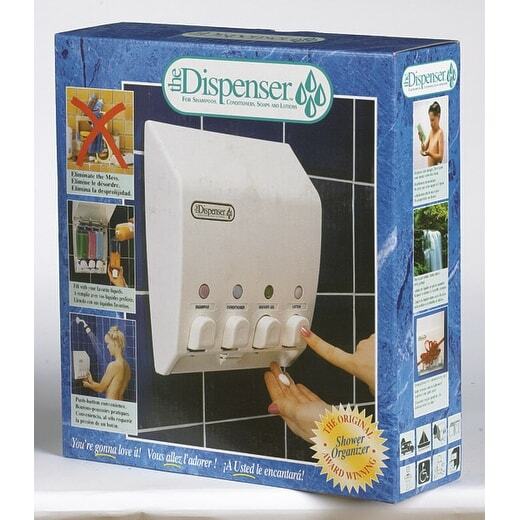 Push button dispenses a pre- measured amount of up to 4 of your favorite soaps, shampoos, conditioners & lotions. So happy with this. My various bottles of clutter in my bath rreduced, and now I wont be nocking them all down anymore. Truly very easy to install. Great quality. This is very functional for our showers. It’s sturdy and stays up on the wet, steamy wall. We ordered 4, one for each bathroom. Very happy with this purchase.